I’m really getting into the swing of making a more-than-occasional dessert these days. I’ve never been big on them, and certainly wouldn’t order them in a restaurant (My typical splutter: “What! €7 for a ball of ice-cream and some sauce? No thanks!”). But, as the crafty hausfrau that I am, a lightbulb plinged brightly in my head as I read through Mrs Beeton’s recipe for Lemon Blancmange. With quite a lot of fresh lemon juice being added at the final stage, surely, I realised, surely this is an excellent (and yet so subtly sneaky!) way of slipping in the benefits of more fruit into our – well, specifically my veg-and-fruit-shy boyfriend’s – diet. I sincerely hope he never reads this post. 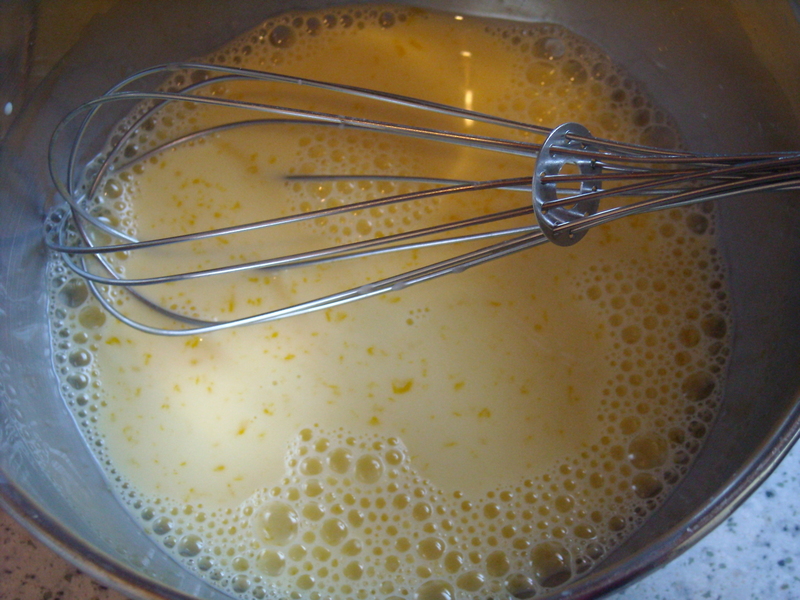 INGREDIENTS – 1 quart of milk, the yolks of 4 eggs, 3 oz. of ground rice, 6 oz. 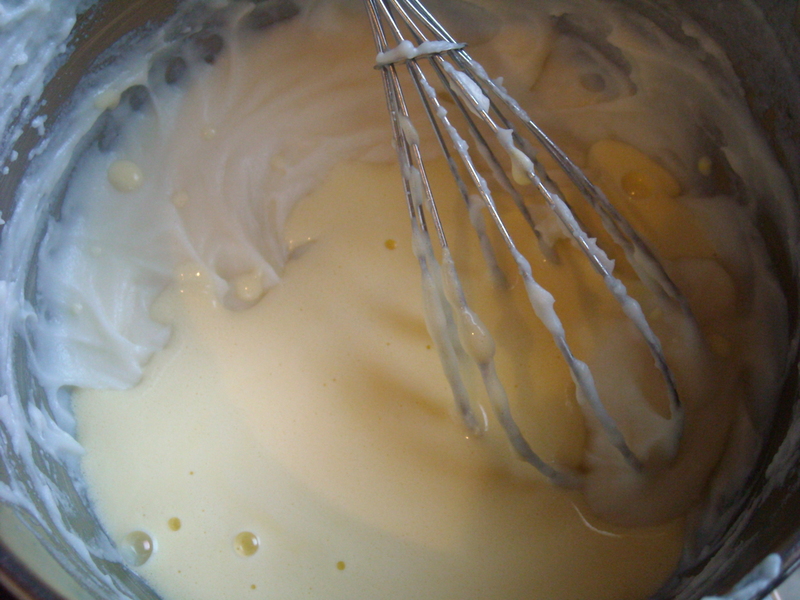 of pounded sugar, 1–1/2 oz. 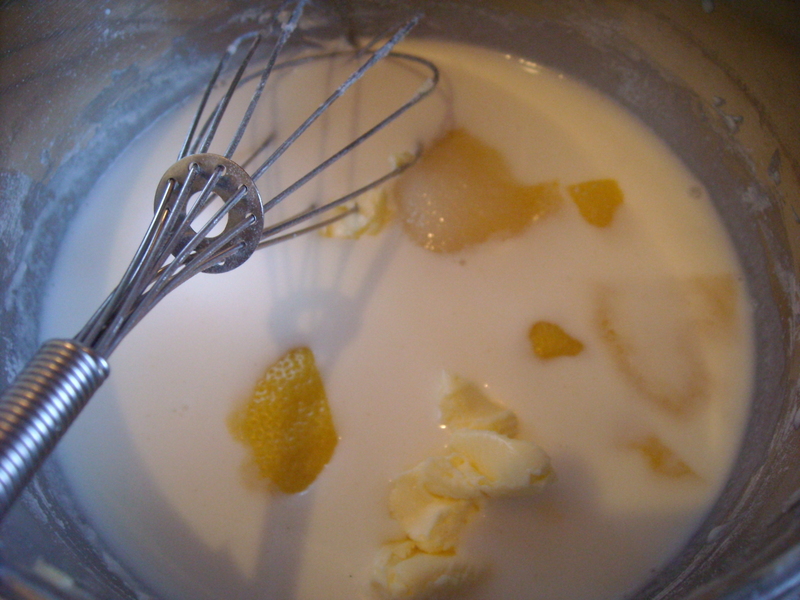 of fresh butter, the rind of 1 lemon, the juice of 2, 1/2 oz. of gelatine. 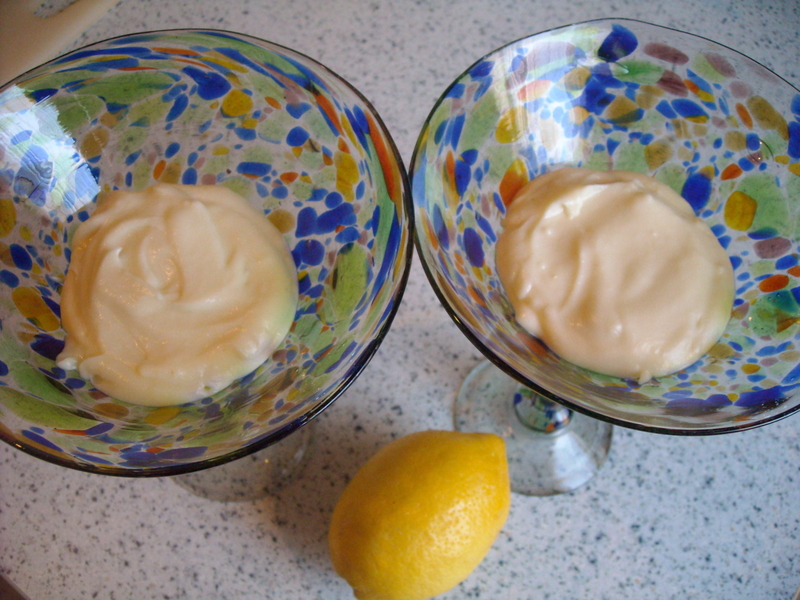 Again, this is a recipe where agar agar (or, I guess, any other vegetarian gelatine substitute) works very well. It’s a 3-stage recipe, but none of these are long or complicated – and in fact, I had some of the pots with various separated ingredients on the go at the same time. 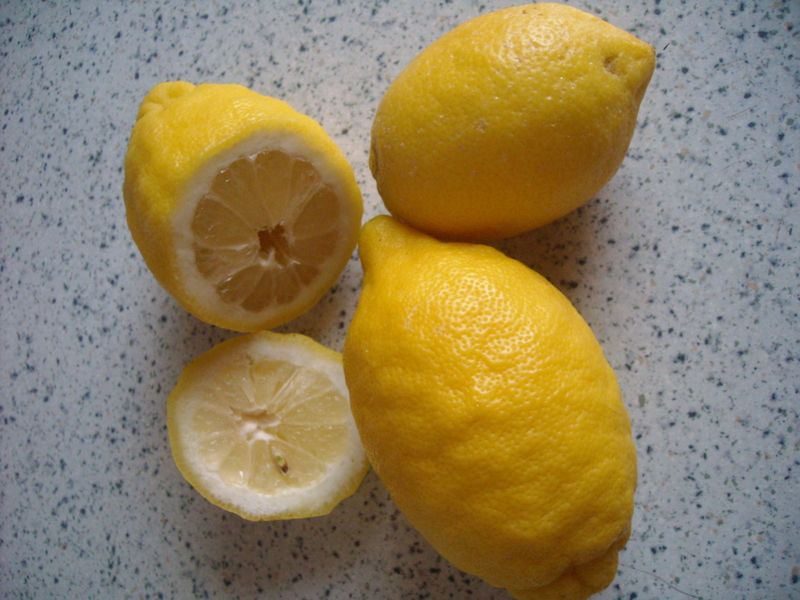 At the final stage, everything gets added together – including the lovely, fresh, vitamin-rich lemon juice – and popped into the refrigerator to chill. The only thing I was a little confused about was the ”lemon rind”. Most recipes these days calls for it to be grated. However, Mrs Beeton made no mention of this, and later refers to ”…leaving out the lemon peel” (which I could only assume meant the aforementioned lemon rind). So I peeled the rind into thin slices and added this to the mix, removing them later just before chilling. 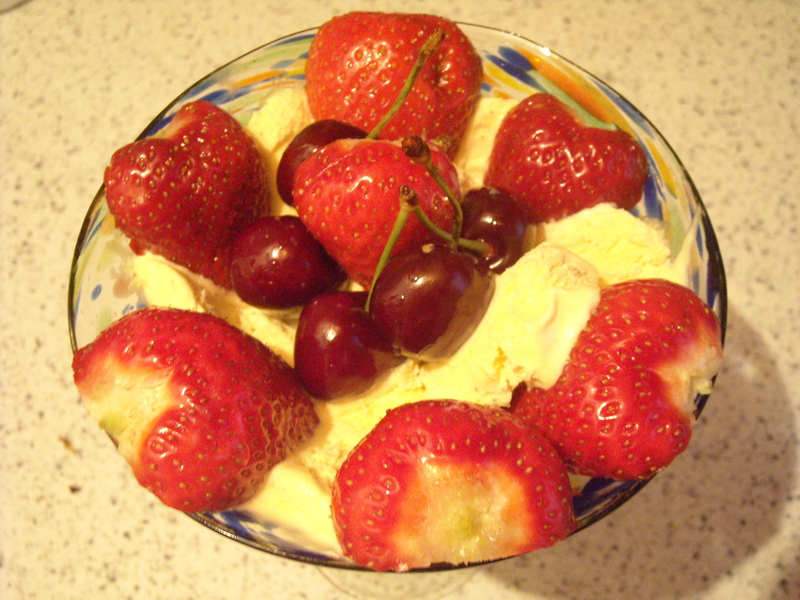 “How did you like it, then?” I queried cheerily as we finished our bowls (to which I’d added the first of the season’s sweet cherries and strawberries, plus a helping of vanilla ice-cream for good measure). It was OK, nice, very nice, OK. It would have been more OK, nicer, very much nicer, nicer, more OK, had I not accidentally added a little too much rice flour (I’d absent-mindedly added the remains of the pack into the mix, instead of the precisely weighed amount I’d already put aside for use). Possibly if it was a little more sweeter, that would also have helped. But, I don’t think he’s against finishing the rest of the blancmange for dessert tonight. Especially with the sweet lure of bourbon vanilla ice-cream heaped alongside it!